Some of the best meals that will ever come out of your kitchen will come out of basic necessity. For example, the other day I had planned on making this lavish meal that was going to blow everyone's mind, but after a very busy afternoon, by the time dinner rolled around, I was not in the mood. So, of course, I went to the fridge and pantry to see what I had on hand. I just want to tell you that this dish was absolutely luscious, and I know you are going to want to make it for your family tonight! Of course, as it is with all of my pasta recipes, the first thing you want to do it bring a pot of salted water to a boil, add your pasta, and cook according to the directions on the package. Place your deep skillet over medium/high heat, and allow the skillet to get hot. Season chicken with salt and pepper, making sure all of the pieces are well coated. Cook chicken until golden brown and cooked through. When the chicken is cooked, remove from the pot, and set aside. Add the butter to the pan, and allow to melt. Add the garlic and allow it to cook until you can smell it coming from the pan. Add the wine and allow it to reduce by half. Then, add the cream and let simmer until it thickens. Once the sauce has thickened, you can add the spinach. I know this looks like A LOT of spinach, but it will wilt down. Place a lid on your skillet and allow the spinach to wilt. the sauce out a little. your mood or time restraints. 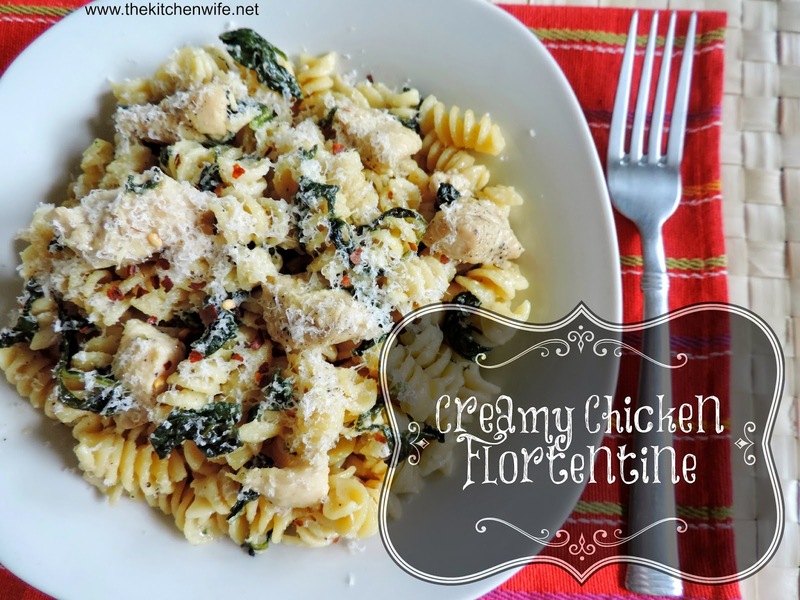 Give this Creamy Chicken Florentine a try tonight, you wont be disappointed! Place the skillet over medium/high heat and ﻿get hot. Season chicken, liberally, with salt and pepper. Add the chicken to the skillet until golden brown and cooked through. Add the butter to the skillet and allow to melt. Add the wine to the pan and allow it to reduce by half. Add the cream and let it simmer to thicken. Add the spinach to the pan, cover, and allow to wilt. Toss until everything is well coasted. You may need to add a little pasta water to thin out the sauce. Serve, top with more cheese and chili flake, and ENJOY! *reserve a cup of the pasta water before dumping the pasta.